You do many things, but get bothered by thinking that much more needs to be done. You tell yourself that this is not enough. You get confused many times and your mind forces you to think that you are in a wrong profession, or may be with wrong people or environment. You tend to appreciate people who use reasoning even in a routine job. Solving real problems excites you. Working on your own is a need for you. You often wonder why some people won't read instructions. Do you also feel you are operating in low gear in the work place? Do you generally avoiding trouble areas? All this could probably mean that may be you are multitalented or you are having more than five to six aptitudes and reasoning aptitude is topping the list. And probably you need to check and plan for self structuring to solve your problems and reach your dream quickly. You should know that you are actually different with different needs. You are competent in many ways. But you tend to be either domineering or overwhelming in relationships with others. Rarely identifying with group norms, and sometimes challenging the basic assumptions of the group. You may be clearly perceived by others as powerful. Many a times, you are surrounded with internal conflict, self-esteem problems and confusion. These problems are usually not apparent as you appear to be functioning very well. You will be brilliant in many aspects of work and life. It is only over time that the pattern of difficulties begins to emerge. Even though this behaviour might seem daunting or perhaps you feel that this is not how it should be, but let’s understand this very clearly - there is nothing wrong with being multitalented. It is something that has to be worked with. 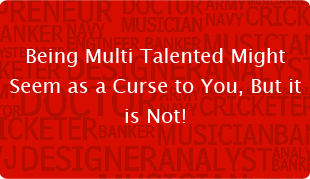 For most multi-talented people, it is likely to cause problems at one stage of life or another. Many of them never learn to use aptitudes well. Such individual sometimes land up with worst problems of financial viability or professional success. Though there are no easy answers, but there are better ways to work if a multitalented person. People with multiple aptitudes need to select careers carefully as they function best at intellectual, social or physical frontiers. Multitalented person often do well as trouble shooters, innovators or problem solvers, in research or investigation, and in product or method development. They also seem to do quite well in difficult situations, fighting long odds and give best at inevitable tasks and situations. Choose the work that provides a lot of variety, challenge and opportunity for use of diverse talents--usually multi-disciplinary areas. Even then, if you think you are underachieving, set higher goals for yourself and work towards that. Focus on high achievement. Do not get into hypercritical mode. Avoid noticing flaws and loopholes, errors and inconsistencies. Your reasoning skills make you good arguers and can tear just about anything to shreds - including yourself. Avoid! Do not destroy personal motivation and energy, channel your diverse aptitudes. Take a standardized aptitude test, understand your strengths and do better. Being multitalented can either work to your advantage or disadvantage, depending on how you utilize, or don’t utilize your talents. That is why it is important that you consult a good career counselor to find your right career path.